If your amateurs of sweet and soft flavours, you will find here the Best Fruity E-Liquids in our exclusive selection. You can let yourself be tempted by the natural aromas of Pear and Raspberry, by the acidity of Red Fruits and Lemon, the soft gourmet of Banana and Apricot, or the exotic taste of Mango. Which ever your preference, you will find here the Best Fruity E-Liquid for you. 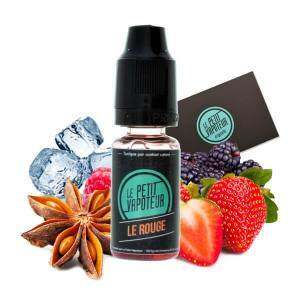 Do not look elsewhere: The Best Fruity E-Liquid is certainly here in the Le Petit Vapoteur store. A simple Raspberry, Juicy and Sweet. if you like Passion Fruit, you will be won over with this liquid. An exotic, tropical swirl, best by the waterside. Peach liquid from VDLV with slight suspicions of a well known syrup. As a rocket launch , this flavour is a real explosion in the mouth... A vibrant mint flavour. A delicious Lime, slightly acidic to accompany a pre-drink. Notes of dominant Strawberry and Blackberry. A winning duo! Rose Bubblegum Taste from your childhood. Sweet and Soft. A perfect balance between Strawberry and Kiwi bringing the freshness of Mint Leaves. The pleasure of a real Pina Colada with Coconut Milk softened by the flavour of Strawberries. A Fruit Cocktail with a rose Grapefruit. Acidic, Refreshing, Sugar mix. The soft version of the celebrated e-liquid Heisenberg by Vampire Vape : Less freshness but more fruity flavour. The famous Pinkman by Vampire Vape with added Strawberry! The celebrated Pinkman by Vampire Vape, refreshing by Mint, type Heisenberg ! A detonating mixture of Guava, Papaya, Mango and other exotic flavours. An addictive liquid. Discover a duo of Mango and Raspberry. An audacious liquid which will surprise you. Need some freshness? The fresh Blackcurrant will complete you. Fruits of the Forest with Menthol Jelly. An E Liquid in 10% / 90% PG/VG for a good production of vapor. Superfruits and Iced Orangeade ! An E Liquid in 10% / 90% PG/VG for a good production of vapor. A mixture of original fruits, with a base of Lychee, Dragon Fruit, Grapes and Banana. An e liquid for amateurs of Fruity Liquids. A strong flavour, base flavour of Grapefruit, Lemon, Orange and Strawberry! An infernal juice with a combination of Red Cherries and Berries but also with a Eucalyptus, Aniseed and Menthol. A very tasty Melon E Liquid. Sweet and Fruity, the Tropical Melon Madness will please your tastebuds. An explosive mixture of Strawberry and Watermelon. Sometimes fruity and acidic. A fruit cocktail with sweet grapes when inhaling and unctuous ripe apples at the end of the vape. Exotic mixture of Fresh Pineapple, Mango and Guava and some Caribbean Fruits! A selection of juicy and delicious Granny Smith Apples perfect harmony with a Cranberry finish.Balanced and Refreshing. Peps and Zest, its sparkling and wakes you up. To be urgently discovered ! Take a walk in the woods... Wild Strawberries, flavoured and subtly perfumed. Real Orchard Apple, with a sip of sunshine, take a bite under the trees ! A mixture of fresh and crushing Mango, Pineapple and Orange which will remind you of the Malaysian Juices. A sweet Cocktail with Grape Juice and spirited Lychee to awaken your taste buds. 50ml in 0mg Nicotine. Composed in Cactus and Wild berries, the Clone offers a tasty voyage faster than the speed of light for your taste buds. Green Mint and Fresh Mint with a sublime Lemon Cactus. E liquid in 10/90 of PG/VG for good production of vapor!